This 11.1 MB PDF instruction document (Nikon calls it a “Guide to Digital Photography”) for the Nikon D700 should prove to be a fantastic read, all 472 pages of it — be sure to download it! Both English Language (printable and non-printable) and Spanish (non-printable) versions of the D700 owner’s operation guide can be downloaded. 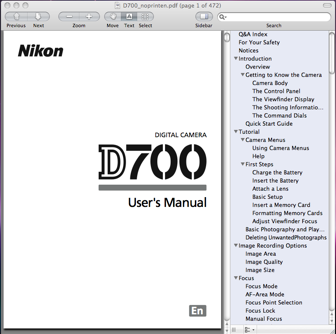 The user guide, which is titled “Nikon D700 Digital Camera User’s Manual” (the 11.1 MB Acrobat document that I referred to) is available in printable and non-printable versions. 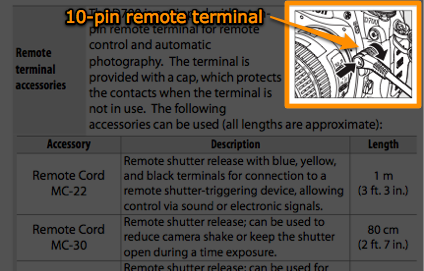 The guide discusses the features of the D700 and how to use the camera, for instance, on page 389, there’s a list of accessories that can be plugged into the remote terminal. The Phottix Cleon N8, a hybrid RF (radio frequency) wireless shutter release (trigger), is an example of such an accessory. Popular Nikon D700 books and other printed literature and reading material in the Arts & Photography and Books section on Amazon.com. Visit Nikon D700 for reviews, tips, tricks, techniques, resources and other helpful information.